What do Pokémon Go and the Women’s March have in common? And what do these have to do with qualitative market research? The phenomenon Pokémon Go as well as the Women’s March in January 2017 are two examples of topics and events that spread across the globe, demonstrating today’s world connectivity. Within a few days of its launch, Pokémon Go was played by millions of players across the world and widely discussed in the media. 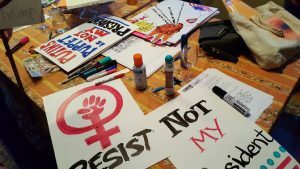 The Women’s March, on the other hand, started on a local level and spread to global interaction through the use of social media. Because Pokémon Go and the march resonated with millions of people around the globe no matter of their ethnicity, origin, language, time zone, they were excellent case studies to demonstrate how a global Blitz Community could deliver qualitative insights in as little as 48 hours. In 2016, Think Global Qualitative, a team of international researchers, conducted the first Blitz Community on the topic of Pokémon Go. In early 2017 another study was conducted around the Women’s March to proof the Blitz Community concept and refine the concept. The purpose of a Blitz Community is to develop a qualitative global snapshot of one specific, up-to-date-topic. The method has four key characteristics. First: It explores current topics of interest to a broad range of people across the world. Second: The community is launched on a global level to gain wide insight. Third: The questions are kept short to get a fast turnaround — even in as little as 48 hours. Fourth: Insights from the study can be used as the basis for a deeper discussion or follow-up study. A Blitz Community is useful for projects that require quick and global insights. An online platform is used to interact with participants. In the case of the Blitz Communities, Think Global used Focusgroupit as a platform. Making use of the advantages connectivity provides and the engagement this young generation has with internet and their mobile phones, an approach was selected where participants could log on to the community across all devices, to respond to questions and make comments on the go using their mobile phones. Since these projects addressed a broad range of respondents, a platform was chosen that is mobile optimized so it could be accessed from desktops as well as tablets or mobile phones. Furthermore, it allowed a quick and easy access rather than having participants download an app specifically. This would have reduced the willingness to participate since it increases the effort respondents have to go through. If the study was incentivized, however, using an app that is dedicated to research, is a viable option. Participant recruiting was short and straight-forward. 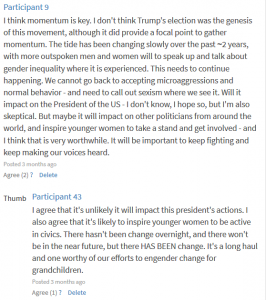 The selection criteria can be as simple as “If you play Pokémon Go we would like to hear your opinion!” For the Women’s March, for example, researchers wanted to gain an understanding of the different viewpoints, so it didn’t matter whether someone participated or just read about it in the news. Recruiting was conducted through personal social media and networks of the researchers and snowball effect since the selection criteria were simple and the showcase topics of broad interest. Online recruiting allowed the researchers to efficiently reach people from all different continents. Although these case studies utilized social media, Blitz Community recruiting could also be conducted through client contacts or customer base and forums, for example. In both cases, a few dozen participants from different countries participated which allowed for spontaneous discussion. If anything was unclear, the moderator could probe immediately. Rather than asking participants a lengthy list of questions, Blitz Communities utilize just a few short questions that encourage participants to stay engaged and interact with each other. In both cases we used three main questions (besides asking for gender and origin) and participants would see the following question as soon as they answered the previous one. Once answered, they could see what other respondents wrote and respond to that. More in-depth research could be used afterwards if this was needed. During the studies, continuous moderation was possible through the multi-lingual team of researchers. 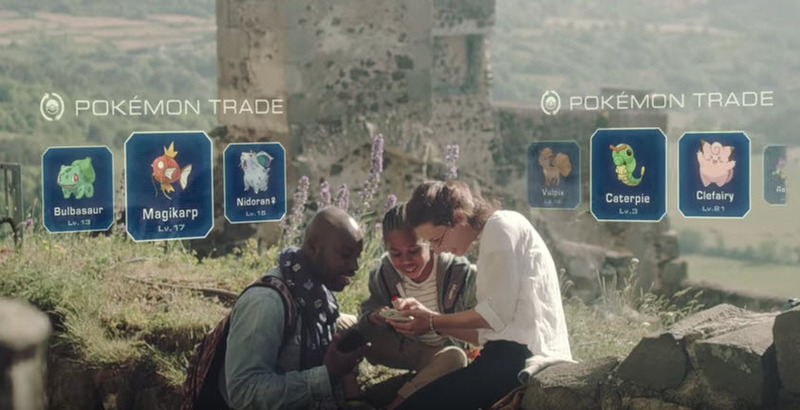 The Pokémon Go community, for example, first opened in Australia and India, followed by Europe and Africa and eventually Latin America, USA and Canada. On the other hand, the Women’s March launched globally at the same time so participants could immediately interact. In order to allow participants to engage in discussion, the overall language was English. 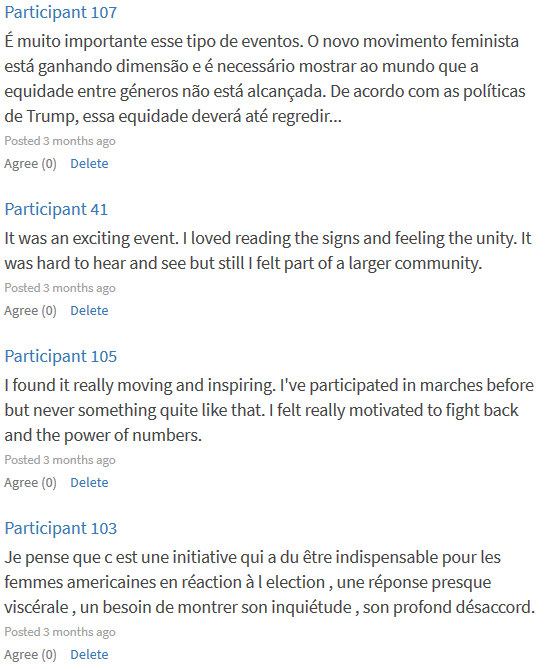 However, participants also had the option to answer in their mother-language since they liked to read the English comments of the other participants, but prefer to answer in their very own language, that lets them express their thoughts much better. These comments were later translated by the participating moderators. With Pokémon Go, for example, more than 60 participants from countries including Australia, India, South Africa, Germany, United Kingdom, France, Mexico, Brazil, Canada and the United States participated. In the community, participants can answer some general questions, share their opinions but also engage with other participants in English to discuss this topic. Through a period of 48 hours all participants could log in, share their answers, views and opinions and interact with the other participants. Since the interest in both the topics chosen to conduct Blitz Communities was quite high, only a minimal incentive (Amazon vouchers) was used in the case of Pokémon Go in a few countries to increase participation. For the Women’s March, no incentive was given and yet there was still a high number of respondents since people were interested in the topic and like to engage in discussion. The communities generate insights into what individuals around the globe are thinking at that specific moment – commonalities and differences – and even generate potential improvement areas. Within this short time frame, Blitz Communities made it possible to generate results rapidly and provide a global picture. Yet, the moderators of ThinkGlobal were also able to bring local know-how to the table, to enhance the overall outcome. Taking the Pokémon Go study, for example, people around the world agreed that it was something completely innovative to use one’s surrounding and open space for gaming, and allows for interactivity. “We are becoming increasingly digital and the borders between reality and augmented reality will become blurry,” one participant said. 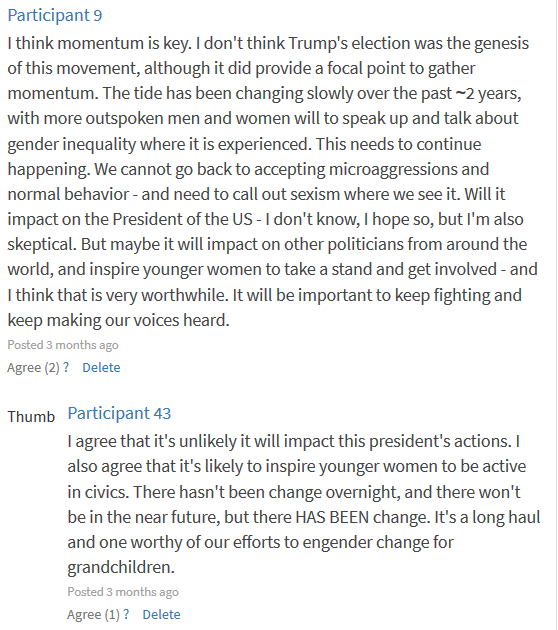 The Women’s March Blitz Community focused on demographics and on the three questions to gauge the long-term impact of the march: What? So what? Now what? Within a short time more than 100 participants from five continents participated in the discussion. While the majority were female (76%) there were also male participants engaging intensively in the discussion. 1) The march inspired pride for both marchers and non-marching supporters. 2) The message of the march was loosely defined, but centered on human rights. 3) Participants were skeptical about the impact the march would have on political leaders. 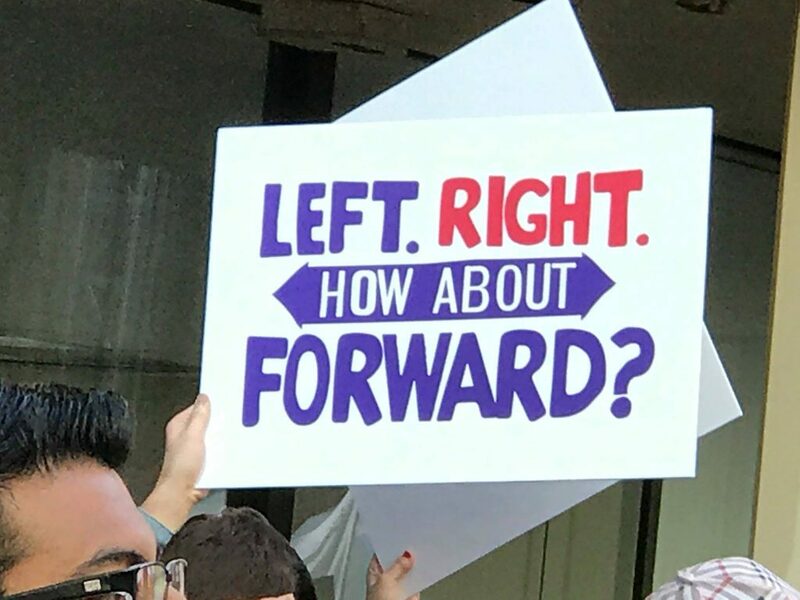 4) The march helped those who previously felt isolated in their views, by showing that other people share their view and provided a source of optimism about the future. 5) Some participants felt that the march was a misplaced effort, launched by women who should be happy with their situation. 6) The march has already acted as a catalyst for further action for some. 7) The march highlighted the many divisions that exist, among women, and among progressives. 8) The march showed what is possible, even if started on a small level, and may be a foundation for further action. This tool can be used as a great start for a project, before deciding on topics to dive deeper. It can also be used to get quick feedback on a concept or to test-run ideas. When used with social media recruiting and free of incentives it is important to have a topic of high interest to the target. With professionally recruited and incentivized respondents a little more lead time might be necessary (extra day) but then a more private and deeper discussion can be expected. Ideally this can also be used with client databases to get quick feedback from their own customers. By making use of growing connectivity and involving the smartphone as a medium it has become easier than ever before to take down borders and conduct on the spot research on a global level. 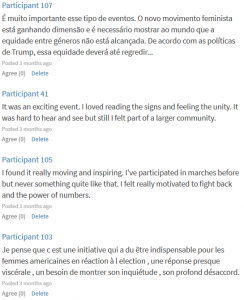 Both the Women’s March and Pokémon Go studies demonstrate how Blitz Communities can be used to generate insights into a topic on a global level. We can compare countries. We can encourage participants to interact and discuss with each other on the spot. And all within just a couple of days! Janina Weigl is an associate of IKM GmbH of Munich, Germany. She is based in New York City, New York. A version of this article originally ran in the Fall 2017 edition of QRCA VIEWS Magazine, which is published by the Qualitative Research Consultants Association.